The value of getting the right help at the right time can’t be overstated. We’ve got a variety of resources to equip you with the latest techniques and practical guidance for charity sector professionals. 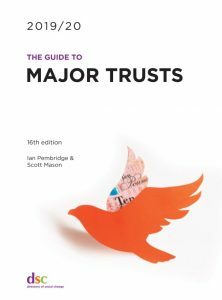 The Guide to Major Trusts 2019/20 is the UK’s definitive detailed guide to grant funding. If you need to find grants for your charity or project, this guide is your definitive information source to over 1,000 of the largest grant-makers. This guide provides thorough backgrounds on grant sources, as well as commentary and advice on how to apply and what grant-makers are looking for. This sixteenth edition offers information on 1,004 of the largest grant-makers which award a combined total of over £5.5 billion. Our charity training equips you with the latest techniques and practical guidance, giving you the confidence to get back to your work and make a real difference for those you’re there for. All from top trainers, experts in their fields, with hands-on experience.